I help busy, professional men and women survive and thrive during major life transitions. Mary Mahoney, LCSW is an author and professional feminist speaker. She is passionate about supporting the wellness and activism of individuals around their reproductive health. When pregnancy is addressed in popular and political culture, the focus is often on the outcome: the new mother and her baby. The experiences immediately preceding parenthood – conception, pregnancy, and birth – tend to be folded into a singular, idealized, and, ultimately alienating, narrative. In reality, matrescence, or the process of becoming a mother, can be a messy, disorienting rite of passage, fraught with intense psychical and physical changes that disrupt one’s sense of self. The ambivalence associated with this complex identity shift can leave parents-to-be feeling anxious, frustrated, and full of self-doubt amidst the feelings of joy and love toward the person growing inside them. This anthology considers the profound impact pregnancy has on views of self and worth, as pregnant people stand on the precipice of an immense life change. Highlighting the personal narratives of the authors while including crucial theoretical insights, this volume explores themes of memory and trauma, family history and cultural expectation, guilt and shame, anticipation and hope. Contributors touch on topics such as advanced maternal age, queer conception, adoption, chronic illness, and loss. 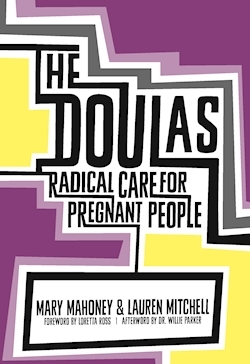 This collection effectively captures the unique, individual experience of pregnancy while uplifting the collective struggle of selfhood that arises within the process of creating a family. One of my biggest passions is supporting the wellness and activism of individuals around their reproductive health. I give talks and lead discussions at universities, nonprofits, companies, and conferences around the country. My goal is to engage and strategize with communities about how they can take an active and empowered role in their reproductive wellness. To inquire about booking me as a speaker, please contact me here. © 2018 Mary Mahoney Therapy.